The new site for the Initiates Way™ is now online! Click the image below to take you to the new Site. Find yourself a comfortable space where you will not be disturbed for at least 20 minutes and have a pen and paper / journal to write in once you have finished. Perhaps light some candles and incense before you begin to set the mood. Use the words below before you begin then listen to the recorded version on youtube below. A seated position is best so that you won’t be tempted to fall asleep. I call to the Guardians of the East, South, West and North to attend our (my) circle should it please them. I (We) am (are) here of my (our) own free will to work with Spirit in all of its forms, to honour the Goddess and God within and without. Spirit Guides, Ancestors, Elders, Helpers, Teachers, Angels and those who work with the light please join us (me) in this evening (moment) so that we can work together to strengthen the connection to the otherworld while we work in our Sacred Space. Initiates Way Exhibition currently showing at the Old Fire Station in Carlisle. The current exhibition is a series of paintings that Jade has created over the last year and a half which tells the story of the Archetypical Spiritual Journey or the Fools Quest after enlightenment. Click here to visit event page. 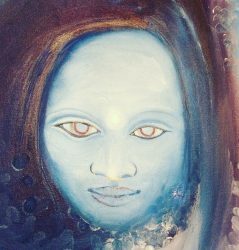 Each painting is a stage in the spiritual journey and presents an archetype that is the embodiment of that particular stage in the journey. To get to know these stages intimately yourself Jade has created 22 Guided Meditations so that you can participate in the journey from the comfort of your own armchair. Esoteric Art is simply Art that comes from within and the process of creation requires only that you be able to still the mind and listen in the silence before you begin to create. If you would like to attend a workshop Jade will be offering a group guided Meditation and a talk about the Initiates Way on the 20th of May at the Old Fire Station in the Parquet room. £5 entry fee. When you visit the exhibition take a photo of yourself wearing the fool hat and pose with the jester stick and post to social media with the hashtag #initiatesway. Don’t forget to sign the guestbook! The Initiates Way paintings will be produced as a set of Tarot Cards later in the year with an accompanying book about the process of creation and explanation of the symbols and the Imagery. Check out the Magicians Table at the back of the room where you will find the tools of the trade. Jade created her first Tarot deck the ‘Soulscapes Tarot’ in 2013 which you can also try out for yourself at the exhibition, and decks can be purchased directly from the Artist. Glasgow born Cumbrian settled Esoteric Artist and Musician & Performance Artist (singer songwriter). (Dark Moon) Transitions, dreams, healing, wise women, prophetic dreams, mystical experiences. The important symbols associated with the High Priestess are sleep, knowledge and everything that is ruled by the lunar tides, or the fluctuating currents that one cannot see but affect everything on our planet from the rising and falling of the sea to our moods on a daily basis. The tiny sliver of light we see after the dark of the moon which heralds the beginning of a new lunar month in the agricultural calendar some believe is the time for thinking about starting new projects and retreating within to listen to ones own inner guidance, and certainly a time for sending out healing to those in need. On the Rider Waite image of the High Priestess we see Isis veiled, crowned with stars and she has a solar cross on her breast and an open book on her knee. It is the book of the TORA or Tarot, wisdom and understanding and we can think of her as the virgin aspect of the triple goddess, or one who acts as an oracle through their connection to the infinite wisdom of the universe. “Peace, calm, inner world, seeing the unseen, light in the dark, study, knowledge, spiritual wisdom. “Sitting on the brink between a world of light and dark, the Priestess has overcome her inner turmoil and looks back to those in the dark offering a hand of guidance. Unwilling to walk into the light while others still suffer, she turns back towards the darkness, shining light to illuminate the world. She symbolises personal transition having walked the path of darkness seeking and finding the path of enlightenment. She also symbolises sacrifice and suffering as her willingness to carry others with her transcends her personal quest of walking in the light. With all that is magic in the world alive in her heart, the Priestess of the Silver Star offers a guiding light to seekers who wish to explore the deeper realms of mystic and magic as long as she is careful not to let the darkness engulf her. Light – The Priestess can help you tune into your inner wisdom, strengthen your intuition and work with your dreams to explore the inner realms of the problems you face. Holding the lamp of the truth she provides the seeker with the strength they need to face the shadows and guides them to walk forward on their path courageously. Directed will, focus, self employment, leaders, clarity of vision, brilliant minds. On the Soulscapes Magician when you look at it a certain way there are two very owl like eyes peering at you from a background of ever moving energy that culminates in the eternity symbol, or if you look at it another way there is a being standing with arms upraised invoking the power within to emerge into the world, becoming self created. Above the head of the magician in most traditional decks there the eternity symbol or lemniscate and in the Soulscapes image it is entwined onto the background becoming an integral part of the process of being, understanding the fluctuations and flow of information, the cyclical nature of time, the ebb and flow of consciousness which can be directed by the individual once they become aware of the processes within. On the Rider Waite / Pamela Coleman Smith image the symbols or treasures are laid out on a three legged table. The cup, wand, sword and pentacle representing the minor Arcana, or tools of the trade of the magician and it is suggested that he / she understands and uses these forces. In some decks the title of this card is the juggler and the very act of learning to juggle is a skill that must first be learned and then practiced and honed in order to be able to perform. Getting aquainted with our creative faculties and imagination requires the same process. There are 22 Major Arcana in most Tarot decks and each of them represent a stage in the journey of self knowing, an initiation, rite of passage, or major life event that each practitioner passes through on their internal voyage. The rest of the Tarot deck is split into four Suits with 1 to 10 pip cards and four Court cards associated with each suit to make up 78 cards altogether. (Wands / Clubs) Staffs – The Spiritual Realm. (Swords / Spades) Storm – The World of thoughts or imagination. (Cups / Hearts) Chalices – A World of emotions or desires. (Discs / Diamonds / Pentacles – The World of physical things and sensations. Before we go any further with interpretations or explanations it would be a good idea to take out the Major Arcana from your deck and separate them laying them out in sequence before you. You can put them all side by side by side numerically from 0 – 21 so that they read like a cartoon strip. Spend a few moments just looking at each card in this way, and think about any connections that spring to mind as you allow your mind to wander and think about the images. Note down any intuitive thoughts you might receive while doing this a you might just surprise yourself. The Major Arcana cards themselves are not gods or deities per se but each Archetype does have associations with divine beings or images that can be called upon in order that we may experience all these different facets of being in our waking lives. The images below set out in order tell a story of enlightenment and each part is one section of the whole, to show the whole process of enlightenment with the inner part and the outer part of the journey. The enlightenment process is a cyclical one and if we begin our journey by going within as we do at the beginning as the seeker after experience, then we jump into the unknown and travel through the underworld or the world of shadows as the second stage in the journey, then we come full cycle and emerge at the end of the process back to the beginning but with all of the experiences that we have had to work with on the rest of our journey in life. During stages 0 to 10 of the internal Tarot journey we awaken each Archetype one by one by pathworking and connect with each in turn until we come to the pivotal or turning point of the wheel. After the experience at the Wheel of Fortune we go through a transitionary phase at Trump 11 after which we set out to explore the shadow realms and journey through the recesses of the mind for clarity and perspective on our true nature and deal with anything that is lurking in our shadows. When we come out of the introspective dark phase and begin to bring out our true selves into the world will be faced with the decision of whether or not to begin another cycle of enlightenment and begin again or use what we have learned on the journey so far to put us where we should be, and make sure we are heading in the right direction. The whole process allows restructuring or recreating our selves and our life in accordance with our whole being as we move through all of the different experiences which usually are at odds with the ones that we are used to, and after taking time to reflect over the journey as a whole only then can we make lasting changes to our personality, relationships, goals, and seek our true calling in life. Take your 22 cards now and set the out in the Lemniscate or Infinity pattern that and what are the differences that you pick up on when you set the story this way instead of in a linear fashion one after the other? Note down your findings in your journal. To study the Tarot effectively you have to become a part of it and as it becomes a living part of you as the wisdom is digested, imbibed and integrated into life and the only way it can be evaluated is from the inside. Take out the Fool/Soliel Card from your Tarot deck and spend a little time studying the imagery on the card. You can use this as your entry point into an awakening journey using meditation over the specific imagery contained within the Tarot card. Some systems ascribe this card to the act of breathing, the breath, or life itself. The very act of meditation requires that you to focus your energy and attention on your breathing, how quickly or slowly we breathe has an almost immediate reaction on our emotional state especially when learning to slow down the breathing to use techniques such as the fourfold breath. When we step on to the rainbow path we glow with a halo of possibilities and energies, the intellect in tune with the heart and the emotional intelligence, intuition, self guidance all waiting to spread forth to create ripples in the new world which the seeker after experience will create as they progress on the path. The student is ready to take a leap of discovery with the appearance of this archetype in a Tarot consultation and if you have spent a significant amount of time meditating over the imagery and the meaning it evokes and the thoughts and feelings which arise within you, then you will know what to say to a client who has this card in their reading. In some decks the fool is seen with a little white dog but in the Soulscape image the animal figure over the head of the fool shows a protective guardian that walked alongside me on the path as my familiar and not everyone will have the same beast as their companion but this is the beast who accompanied me at the outset of my journey. On the Thoth / Lady Hariss Fool card there is a dove on an upward course also flying free, soaring into higher skies. In early Christian symbolism the imagery of a dove descending represented the descent of the holy spirit, similarly in this image it is that of the inner peace which radiates outwards from the very core of our being to affect all those who we meet on our journey along this path, but only after the acceptance of out own journey and turning our attention inwards to experience the worlds that lay within. This is the archetypal image of freedom, being carefree, unburdened and the Thoth image proudly displays a physical Sun which has come to be understood as the symbol of generative life force or our energy source on the Earth as our celestial sun in the sky. I renamed the “Fool” image as “Soleil” in the Soulscapes deck and choosing the French word for Sun to bring attention to the importance of light, especially sunlight on our physical health and wellbeing, and the allegory of the Sun on its journey through the signs of the Zodiac, and this whole spiritual journey being akin to the birth of the sun god Ra as the resurrected part or self created soul that we bring into existence by stepping on to the Spiritual path and redeeming ourselves through Alchemical transformation of the Soul. A prominent figure in the Crowley image is the alligator or crocodile which represents cyclical time, fertility and a warning of pitfalls on the path if one does not pay due care and attention to where they are treading. As we are turning the attention within and shining the light inside ourselves we illuminate everything and bring to life all that this light comes into contact with. What on this earth grows without sunlight? How can there be shadows to explore without the light of the sun? There has long been an association between light and enlightenment and here if we think about the allegory of the white light being split by a prism into the spectrum of colours, hence being able to see and investigate all the separate parts, or divisions of the soul as we seek in the shadows that have been cast by the light of our own consciousness. Consider the Fool as a garment that we must clothe ourselves with in order to progress and understand he / she as our guide to lead us within so that we may begin to seek our destiny. This article may not be reproduced, copied, shared, stored or otherwise used without the Author’s written permission. #tarotcommunity #greatmotherhealer #Blessings to all.